Seven coats of paint on the body now, and a lot of sanding and polishing to get this looking any good. I got a chance to continue on with the RG450 project today. During the week I managed to rough up the primer with some course grit wet and dry sand paper, and got a couple of coats of white paint onto the body.Today would be the day I would try to get as many coats of paint on the body as possible. I’ve now sprayed seven coats of paint on the body, and I’m hoping that I’ll be able to sand out the imperfections without going through to the primer. There are many runs and pimples to sort out, but I’m hoping the one light coat of paint left in the spray can will be enough to cover any major issues if there are any. The neck all taped up, ready for it's clear coat. 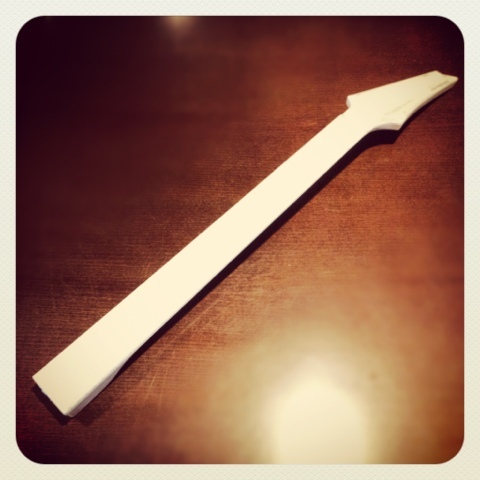 The Japanese Wizard II neck that came with this had been sanded and shaped to closely match the Wizard profile, so it was in need of a clear coat too. I had planned on using a wipe-on polyurethane oil due to its ease of use, and quick drying and hardening time. Unfortunately I couldn’t find any at my local hardware store, so I ended up buying a spray on polyurethane. This was going to take more time between coats, but I hope that two or three will be enough. I got onto taping up the neck to protect the fretboard, fretboard binding, and headstock. With today holding plenty of stormy weather I hoped to somehow squeeze in two coats, so that I would have time to apply one more tomorrow if need be. Two coats down, and it's now stinking up the laundry due to the massive storm that hit 2 minutes after I sprayed the second coat. Too windy and rainy to leave this outside to dry properly. In-between the last few coats to the body I got the first coat on. Shortly afterwards a big thunderstorm hit my area, and I figured my painting would be over for the day. The weather cleared up just as the neck was ready for a second coat, so I decided to tempt fate and apply it. Of course 2 minutes after I finished an even bigger storm came over, and now the neck is resting in the laundry. Hopefully two coats will be enough for the neck, but if need be I’ll hit it up tomorrow morning, weather pending. I’ll also try to get started on wet-sanding the body, and with any luck I won’t need any more paint. I’m not worrying about a clear coat at the moment, but we’ll see how it goes. 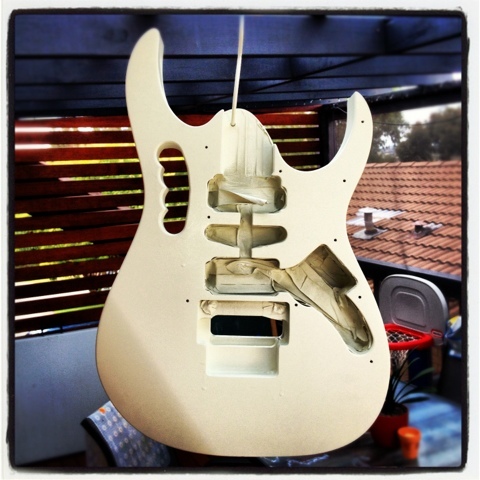 2 Responses to "The Ibanez RG450 project – part 2"
i’m still curious about the kind of common paint used for guitar painting, you’ve specifically mentioned the polyurethane paint…can you described more briefly about this kind of paint? is it came in form of spraycan or else? 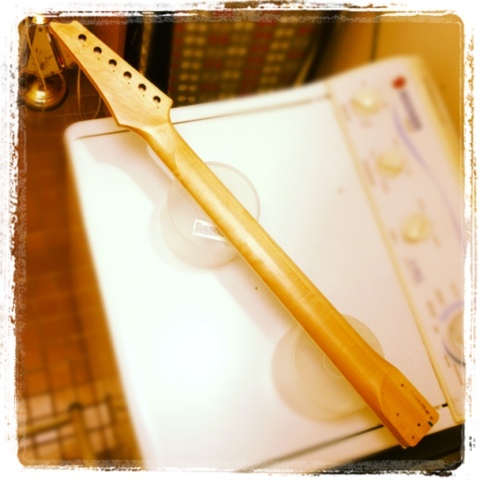 what is the common brand for the polyurethan paint?…is it need to be thinned, and if needed ,what kind of thinner solution have you used for this guitar? sorry about my curiousity and for asking too many questions…i’ve got a compressor set w/ penbrush for aircraft model kit painting and i’ve been thinking about another purpose for it, for repainting my guitar for example….but i’ve never use it with polyurethan paint….commonly we only knew 3 kind of paint for hobbies (lacquer,enamel and acrylic)…thanks in advances….